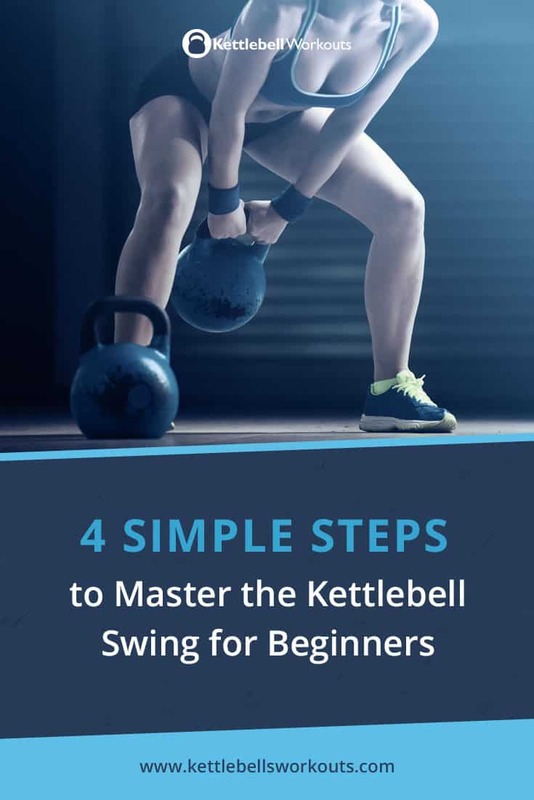 The most effective kettlebell exercise that everyone should learn is the kettlebell swing so below I have made it easy for you with 4 steps to master the kettlebell swing for beginners. By using the 4 simple steps outlined below you can progress to the kettlebell swing without the risk of injury or developing bad habits. The kettlebell swing is a full body exercise that activates over 600 muscles in the body, in particular: the buttocks, legs, hips, core and back. For those with knee issues the swing enables you to achieve a full body exercise without the need to bend painful knees. 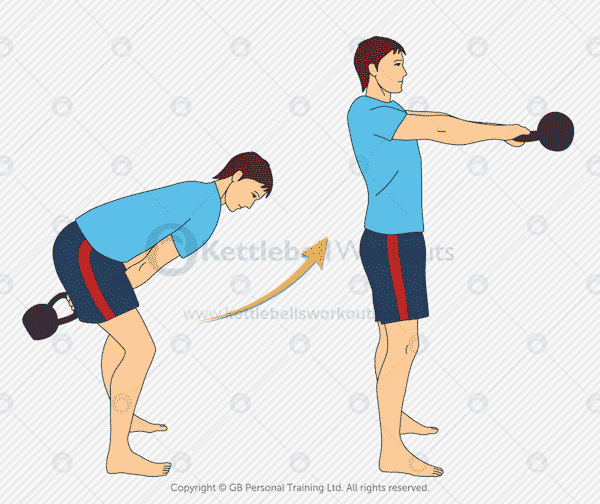 The kettlebell swing will also radically improve the often neglected postural muscles at the back of the body. The kettlebell swing is very cardiovascular and can be performed anywhere without the need to even move your feet which is a great way to challenge your cardio without the need for high impact. Below I have listed the most effective progression for beginners to learn the kettlebell swing safely. 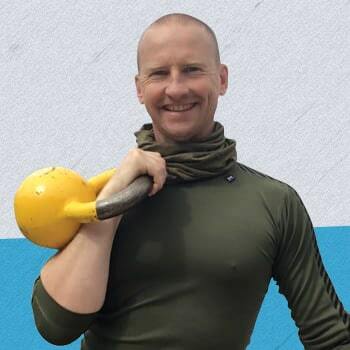 I’ve also included information on what weight to use for the kettlebell swing and some kettlebell workouts for you to use to practice. The kettlebell good morning exercise will help you to better understand and master the hip hinge. The hip hinge is the most important part of the kettlebell swing and involves bending at the hips while keeping the back flat. 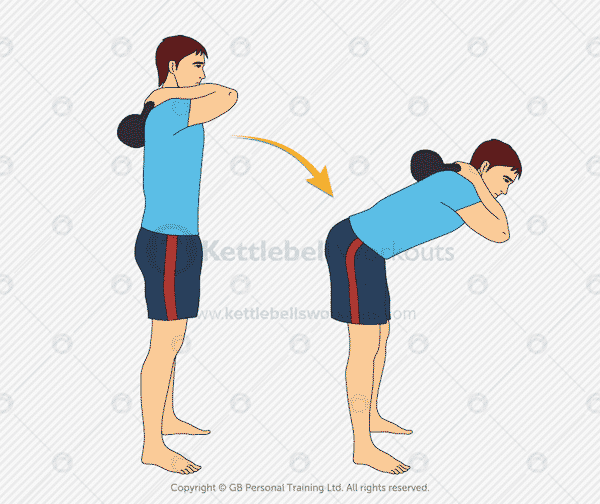 Hold a kettlebell with both hands either against your chest or in between your shoulder blades. Keep your weight back on your heels and legs almost locked out straight. Next push your hips backwards as you lean forwards keeping your back flat. Continue leaning towards the floor until you feel your hamstrings tighten at the back of your legs. Pause for a few seconds and then return back to the standing position squeezing your buttocks tight at the top. You should not be using a challenging kettlebell for the good morning exercise. The objective here is to master the movement not overwork yourself. Men can use a 12kg (26lbs) or 16kg (35lbs) kettlebell and women an 8kg (17lbs). When you feel you can comfortably complete the kettlebell good morning workout above move on to exercise number 2 below. The single arm kettlebell deadlift takes the hip hinge movement and adds a little more knee bend while at the same time keeping the back flat. The single arm deadlift will condition your legs, hips, buttocks and back. When performed with a decent weight and for higher repetitions the single arm deadlift can be very cardiovascular too. Think about picking up a heavy object from the floor and you have the basis for the kettlebell deadlift. Start with the kettlebell on the floor. Keep your weight back on your heels and push your hips backwards to take your hand towards the floor and grab the kettlebell handle. Your back should be flat from your hips to your shoulders. With a straight arm and a tight grip drive your hips forwards in order to use your legs to pick up the kettlebell. At the top position squeeze your buttocks tight and do not lean backwards. Your shoulder should be down and away from your ears. To return the kettlebell to the floor push your hips backwards keeping your weight back on your heels. The single arm deadlift is the strongest of all the human movement patterns so you will be able to lift more with this exercise than any other. Learn to master this movement first before really loading up the exercise but ultimately a slightly heavier load will help you to naturally use the correct muscles. Men can use a 16kg or heavier. Women can use a 12kg or more. You can use the single arm kettlebell deadlift for years and still continue to gain benefits from this exercise providing you continue to add more and more weight. If you wish to progress to the kettlebell swing then make sure you are comfortable completing the above workout before moving to step 3 below. The two hand kettlebell swing takes the above hip hinge that you have been practicing and adds a faster hip snap. If you have been working hard on the single arm deadlift exercise then the two hand swing should continue nicely by replicating the same hip movement. Keeping the arms straight drive the hips backwards keeping your back flat until your wrists touch your inner thighs. Snap your hips forwards aggressively squeezing your buttocks and abs as you stand tall. Do not lean backwards in the top position. The kettlebell should reach chest height and only be driven up by the thrust of the hips and NOT the shoulders. 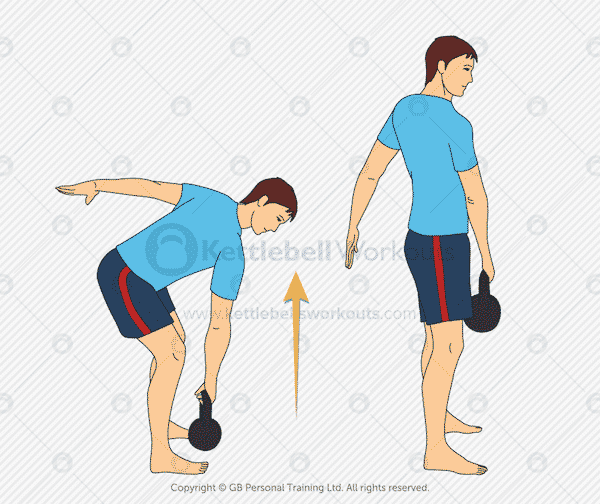 Keep your shoulders back and down away from your ears as the kettlebell descends back down and between the legs again. Think hips and heels throughout this explosive exercise. Beginners should keep repetitions of the kettlebell swing low to begin with. Sets of 10 repetitions before stopping and resetting is a good starting point. Due to the dynamic nature of the kettlebell swing you will require more strength and stability to control the kettlebell as it swings. However, if you choose a kettlebell that is too light then the beginner has the temptation to use the shoulders rather than the hips. Men should begin with a 12kg or 16kg and Women an 8kg or 12kg. Once you can complete 10 rounds of 10 swings with a 20 second rest in between rounds you can move on to the one hand swing. The one hand kettlebell swing takes the same movement pattern of the two hand swing but overloads the shoulder and increases the demands on the core muscles. Due to the natural rotation of the upper body during the one hand swing the core muscles have to fight hard to maintain position. The one hand swing uses a very similar technique to the two hand swing and providing you have been practicing you should have no problem with this variation. Be prepared for more of a pull on the shoulder joint so keep reminding yourself to keep that shoulder back and down. As with the two hand swing the wrist should touch the inner thigh and go no deeper than that in between the legs. You may find that the hand rotates slightly inwards at the bottom of the swing, this is fine, just make sure that the back of the hand is facing up upwards at the top of the swing. Due to the overload on the shoulder joint you should start by keeping the reps under 10. As your shoulder stabilisers strengthen over a matter of 4 weeks you can increase the number of reps. Switching from the two hand swing to the one hand swing and using the same weight can be a challenge due to the shoulder having to take double the load. If you want to use the same kettlebell for the one hand swing then take it slowly and keep the reps low. Men should be using a 12kg or higher and women an 8kg or more. The kettlebell swing is the most challenging full body kettlebell exercise for the beginner to master. Above I have outlined how to progress to the kettlebell swing safely and effectively. 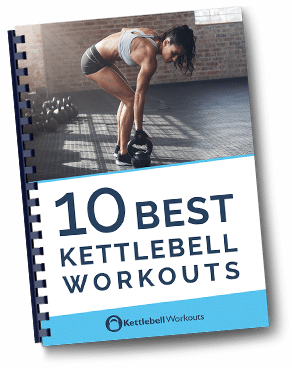 You will have discovered example workouts for you to use along with kettlebell weight recommendations and exercise techniques. Take your time as you progress and don’t rush into the kettlebell swing before mastering steps 1 and 2. Have you used these 4 steps to the kettlebell swing for beginners? Let me know below….